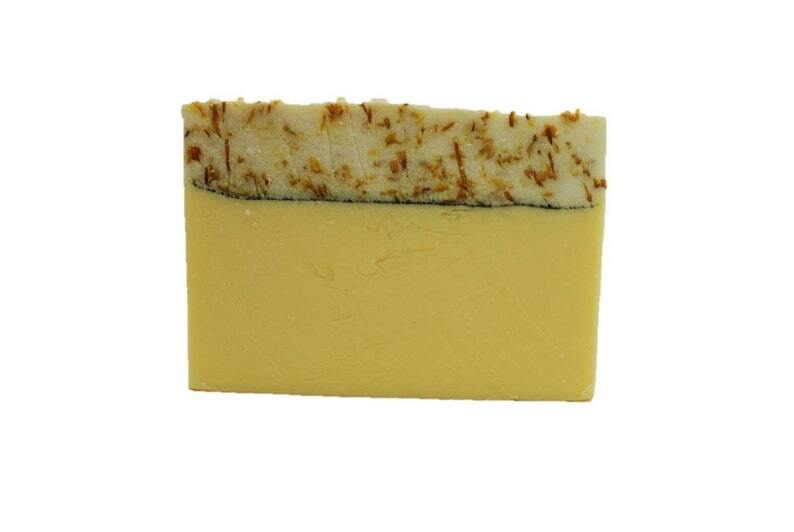 Each bubbly bar contains orange essential oil which delivers an amazing fresh, uplifting fragrance. Formulated with luxurious Shea Butter and coconut oil which produces a moisturizing, smooth, creamy lather to pamper your skin as it cleanses. The addition of Calendula flowers (Marigold flowers) are thought to have healing properties. - Made with quality food-grade coconut oil. - Gentle on your hands. All of our soaps are handmade in small batches from premium food-grade oils and phthalate free fragrances. Your skin is awesome. Shouldn't your soap be awesome too? Each bar is hand-cut from the main soap loaf and will arrive individually wrapped and labeled. Each bar is about 1" thick by 3" wide by 2.5" tall and is ~ 4 oz. of soap net weight. Trial size is approximately .6 - .8 oz. Handmade soap should be placed on a soap dish that allows air to circulate around the soap bar and the water to drain away. Vegan friendly. Highly recommend cleans the tack so well and smells amazing. My trainer uses it and I love how it worked, I don’t regret using this product. As always I love the products. Paypal, Visa and Etsy Gift cards accepted. Minimum 24 hours notice of cancellation required. Notification via email will be accepted subject to confirmation in writing. Unused, unopened, undamaged product in its original packaging can be returned for a refund or exchange within 7 days of receiving products. Horsing Around Soap, LLC. is not responsible for return shipping costs. Please use only a small amount of the products until you are sure how you react to it. If an allergic reaction occurs, please discontinue use. As someone who has allergies, I try my best to use the safest ingredients possible, but we are all different and what is safe for me may not be for you. All ingredients are included in each listing. Some soaps contain almond oil, which might be an issue for anyone with nut allergies. All of my soap contains coconut oil. Please read carefully before you decide to buy to make sure that the product doesn't contain something that you will react to. If you have questions about an ingredient, please contact me. There may slight variations in bar soap due to the nature that they are handmade. Shipping is via USPS priority, or First Class, or UPS depending on the weight. Most items will be shipped within 2 days of ordering and receipt of payment, weekends and holidays may add an extra day to this timeline. Packages will be shipped to the address provided through Etsy. Please make sure all information is correct.